Halloween. For most people it means horror movies, trick-or-treaters and a good excuse to pig out on candy, but for snowmobilers in Northern Minnesota Halloween means the Anniversary of the Halloween mega storm of 1991 that dumped 36.9 inches of snow on Duluth and ushered in one of the longest snowmobiling seasons on record- a whopping five months of good riding. The storm also kicked off what became a decade of good snow and the peak of snowmobiling popularity in Minnesota (a record 297,623 snowmobiles were registered in the state in 2001). Every October snowmobilers begin wondering if this will be the year when snow finally makes its return and gives us a good season. 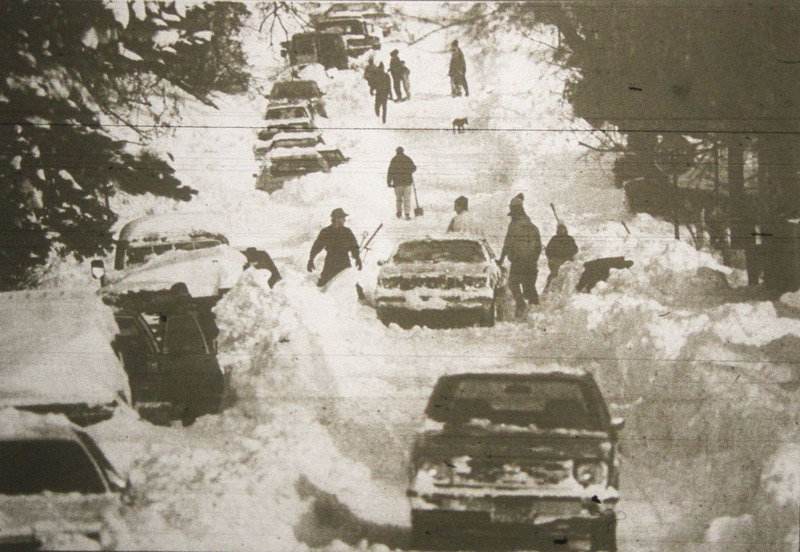 On Oct 15th 1966 Duluth Received 7.9 inches of snow – the Highest snowfall in a single day in October. Duluth’s Record Snowfall for the month of October is 14 inches. The highest 24 hour snowfall in Minnesota was 36 inches near Finland on January 7th 1994. The Halloween Mega Storm was at the time the biggest single snow event in the State’s history but that record was broken January 6-8, 1994 as Finland received 46.5 inches of snow, breaking the old record by almost ten inches! The greatest depth of snow cover in Minnesota history was measured at 88 inches at Meadowlands on January 21st, 1969- Now that’s a good trail base. The snowiest winter on record in Minnesota was recorded at Grand Portage during the winter of 1949-50. The total snowfall at Grand Portage for that season was 170.5 inches. As we close out October on Halloween night you just might wake up to some fresh snow in your yard, and maybe this will be the year when the snow never stops falling and the riding will always be amazing. Until we see you on the trails this winter, remember – THINK SNOW! This entry was posted on October 25, 2013 by John Hartley. One of my snowmobiling friends conveniently happens to be a certified sled mechanic who is in semi retirement, meaning instead of working for a dealer he has converted his garage into the dream snowmobile workshop and fixes sleds and ATV’s on the side for extra income. In late August he called me up and asked me to bring in one of my sleds that was having some horsepower issues that I just couldn’t put my finger on. As I was unloading my sled in the alley a kid came by on his bike and said “Don’t you guys realize its eighty degrees out and there isn’t any snow?” I admit it felt a little odd unloading a sled when I should be at the beach but it got me to thinking about all of the things in the snowmobile world that go on behind the scenes in the summer to make it possible for you to enjoy your winter. All across the state there are snowmobile club members knocking on doors in the middle of July securing easements for new trails and reroutes, event organizers visiting businesses and writing letters for sponsorships for the fall and winter snowmobile events that take place across the state, racers working out the bugs in their sleds getting them ready for opening race weekend at Spirit Mountain, manufacturers cranking out sleds on the assembly line and loading them into crates to get to your local dealer, and finally snowmobiletrail.com bloggers that are sitting at their desks writing mid summer snowmobiling blogs. Before you know it the leaves will be changing, there will be frost on the ground and hints of snow in the air and when that first big storm hits, the trails will be ready for you thanks to the efforts of all the people behind the scenes that make snowmobiling truly a year round affair. This entry was posted on October 4, 2013 by John Hartley.